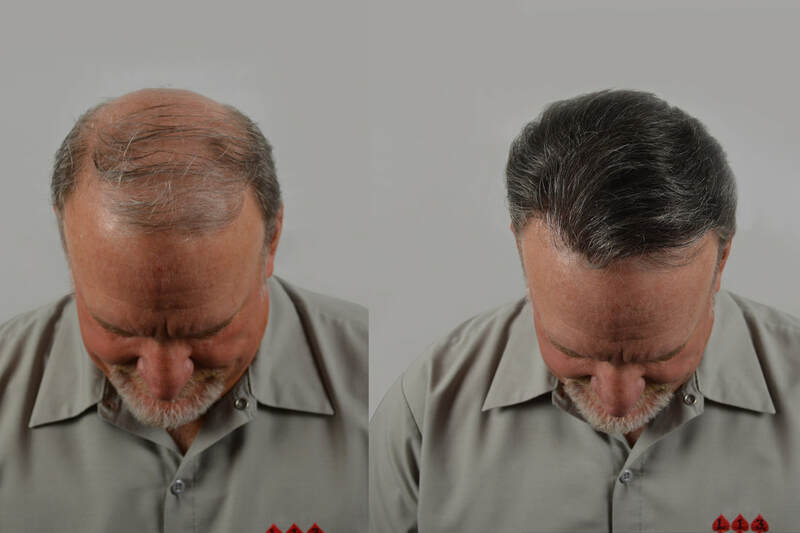 Our hair replacement systems are on the cutting edge of science and technology. 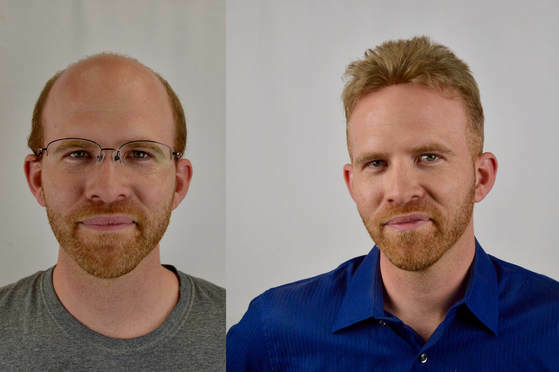 We use a non-invasive approach to hair replacement to focus on the treatment of alopecia, thinning hair, receding hairlines and male-pattern baldness with non-surgical grafting. No surgery, no scars, no surprises. With an undetectable result, you will have the look you have always dreamed of. WE PROVIDE HAIR REPLACEMENT SYSTEMS FOR BOTH MEN AND WOMEN. ​Anything from full custom cut-ins, bonding services, to toppers and wigs. Our professionally-trained hair technicians who are experts in hair replacement will consult with you and examine your thinning areas to determine if you are a good candidate for hair replacement. We will advise where additional hair needs to be added to make your hair look fuller. We take a hair sample so that we can match your exact color, texture, curl pattern and density. Then we build a mold of the area of concern and send it to the lab. Our factories build in the precise angle and direction of your own hair growth to a virtually invisible layer that breathes like skin. Our styling technicians seamlessly blend the new hair with your existing hair using a medical grade adhesive. Your hair is expertly cut, shaped and styled to achieve the look you want. The best part about a hair system is that you get to have a full head of hair again! ​Our hair systems are virtually undetectable, so people will just think you have a great head of hair. They may notice something different about you and wonder if you lost weight or got a new haircut. Mostly, they will just notice how confident you are in your appearance. You even have the option to replace your hair gradually over time if you prefer a subtler transition. ​Absolutely! One in three women struggle with hair loss. We can match any ethnicity, texture, curl pattern or length. ​​Can I work out while wearing a hair system? ​YES! We are passionate about health and have formulated adhesives for athletes. Regular maintenance is part of our service and very helpful for those with an active lifestyle. ​Yes. The hair is completely waterproof and very natural when wet. Feel free to swim or just soak. 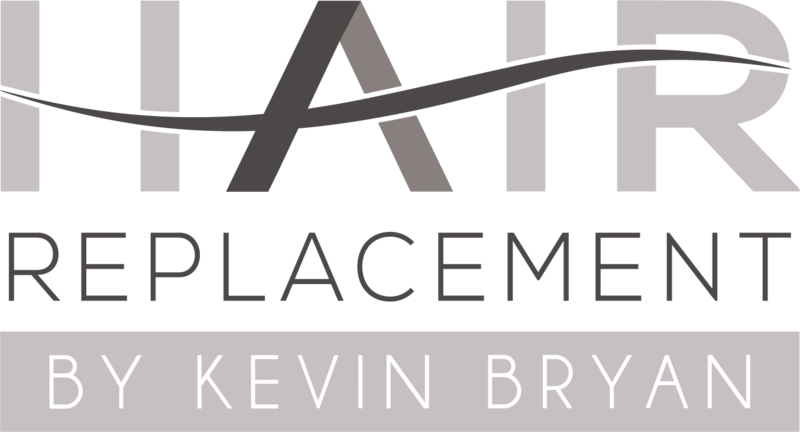 Hair Replacement by Kevin Bryan serves Murrieta, Temecula and Riverside with Non-Surgical Hair Replacement Services for Men and Women. We offer the best Hair Replacement Systems in the Inland Empire area. Our professional stylists assist you with your Hair Restoration not only restore your Hair but to restore your confidence!